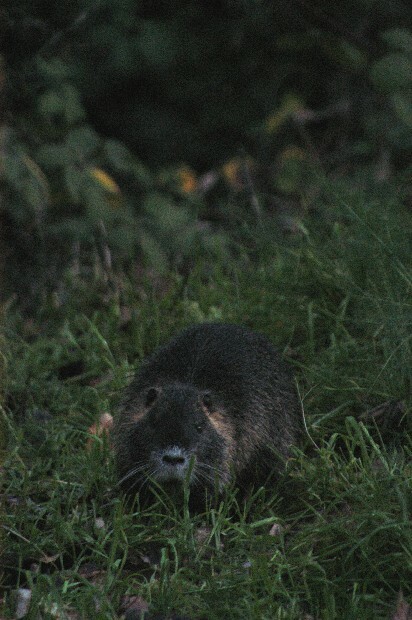 This is a Nutria at dusk near the Willimette River in Eugene, Oregon. I spent most of the day touring around town with my brother-in-law Brian and my nephew Hayden. We had a great time walking down by the Williamette River, eating cheap Mexican food, and shopping around for the best multi-purpose gloves. I found an outstanding pair of gloves that allow me full operation of my camera, like when I had to change lenses to shoot this Nutria before he moseyed through the tall grass down the river bank. I had one slight let-down today ... the Eugene Register-Guard terminated their internship program three years ago. I still enjoyed visiting what I did see of the facilities and my brief, pleasant conversation with Rob Romig, the Register-Guard's director of photography and graphics.